Oregon Autumn is up to the sholder join. I am not happy with it at all but am not going to rip it back to the underarms and start over. My friend Shirley is making the same size as I am and the shoulders look the same. 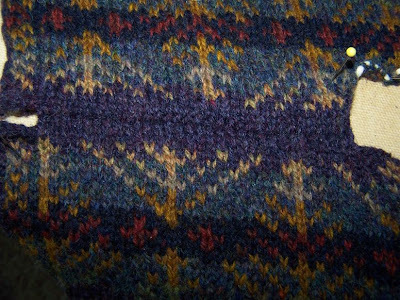 We think it is where the division for the armhole steek starts that is not proportionate. It is a beautiful sweater and will be worn a lot I'm sure. The colors are beautiful and the quality of the Virtual Yarns yarn is outstanding. I wish I'd taken the time to double check the chart layout to see if the shoulders would match but just never thought about doing so. The photo is the armhole steek crocheted, cut open and the shoulder join done using three needle bind off. I chose to just use the background color called for and do two rows of solid color. If you had an odd number of repeats, there is no way to fix that! You might get a matching seam at the shoulder, but the front and back will never match in most patterns. No one is going to see your back and front at the same time!